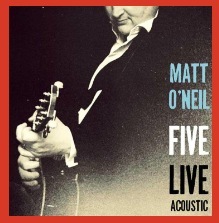 Matt O'Neil's AcousticLiveLounge, recorded at 20:20 studio's. Collection of popular covers as regularly performed by AcousticLiveLounge at all venues. Five of Matt's original tracks recorded LIVE at The Lord Raglan in Emsworth. Now available at all performances. Contact us via CONTACT page for all postal orders.